The Rice Township Board of Supervisors will hold its monthly municipal meeting on Wednesday, November 8, 2017 at 7:00 p.m., postponed from Election Day, November 7, 2015. The meeting will be held at the Rice Township Municipal Building, 3000 Church Road, Mountain Top, PA 18707. Requires Annual Permit ($10 for residents, $50 for landscapers), which may be purchased from the Township Secretary during normal business hours. Leaves, grass and small branches are accepted. Mulch will be available for purchase, rates to be announced. The annual leaf pickup program for 2017 will begin on October 16th and end on November 16th. 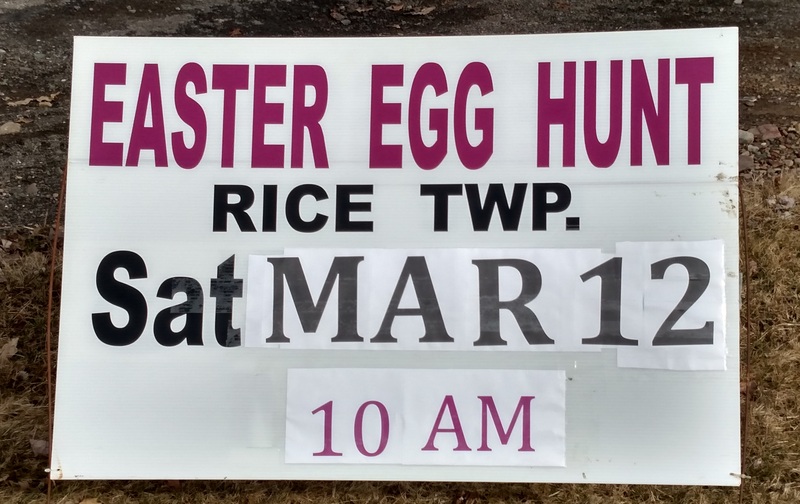 To participate, you MUST have a COG sticker for 2017 ($10.00) and you MUST register with the Township Secretary at the Township Office, Leaves must be in clear plastic bags. After November 16, you may take your leaves to the COG recycling center. Please be advised that the tax collector ONLY has office hours at the Township Building during the Rebate Period. This period is the time period on your tax bill when you receive a discount. After that period, bills must be mailed to the tax collector. At no time may tax bills be dropped off at the Municipal Building. The Tax Collector will be at the Rice Township Municipal Building during the Rebate period: Mondays from 4pm to 6pm. 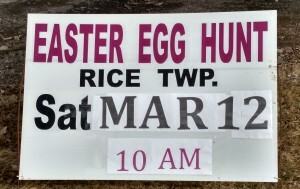 Rice Township’s Easter Egg Hunt will be held on Saturday March 12th at 10am. A rain date is set for March 13th at 10am. All are welcome (and encouraged!) to attend! The SWIFT911 notification system is now live for Luzerne County! Sign up now to receive alerts from Luzerne County EMA and Rice Township at no cost to you. You may choose to receive the alerts via mobile app, email or telephone. The Rice Township Board of Supervisors will hold its monthly municipal meeting on Wednesday, November 4, 2015 at 7:00 p.m., postponed from Election Day, November 3, 2015. The meeting will be held at the Rice Township Municipal Building, 3000 Church Road, Mountain Top, PA 18707. Wright Township Environmental Advisory Council will hold a gypsy moth forum at 7 tonight (Monday, August 3rd) at the Wright Township Municipal Building. The Penn State Cooperative Extension Service who will present information on the gypsy moth and answer residents’ questions. All Mountain Top residents are invited. *Luzerne County asks that the community association assign one person to act as a point of contact for the whole development to making planning easier for everyone.